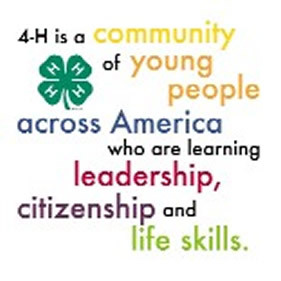 Ozaukee County 4-H Activities are open to all youth in any 4-H Club. Some of the activities do have grade restrictions on them. Watch the “Harbinger” Newsletter closer to date of the activity for more information. You will also find more information and registration forms on the Forms Page. THE HAUNT: The largest fundraiser of the year is a haunted house set-up at the fairgrounds for the public to attend. Youth and adult volunteers design and operate the Haunted House, meet new friends, and have a hauntingly good time. JACK-O-LANTERN JAMBOREE: The Jack-O-Lantern Jamboree is a fun-filled Halloween activity for children 10 and under and is open to the public. The Jamboree includes food, games, prizes and activities and is run by youth and adult volunteers. LEADER-TO-LEADER TRAINING – This leadership conference, hosted jointly by Ozaukee and WashingtonCounties, rotates year to year to each county. Each year the sponsoring county provides a keynote speaker to address leadership skills with youth and adults. Throughout the day workshop sessions include a variety of topics that relate to 4-H projects effective leadership, promotion and community service. Youth in 5th grade and older, adult leaders, and interested parents are encouraged to attend. JUMPING COUNTRY – Join the 4-H fun at Jumping Country. Bounce the winter cabin fever away and enjoy meeting youth from around the county. Youth 5K – 2nd grade are invited for the evening, and youth in grades 3-7 can stay overnight. COMMUNICATIONS FESTIVAL – Each spring 4-H members have the opportunity to participate in the Communications Festival. Members can come and demonstrate their artistic creativity by presenting a demonstration or illustrated talk, an expressive reading, an original speech, creative writing, poster, or a power point presentation. All 4-H Members and Cloverbuds are encouraged to participate. BOWL-A-THON – This is an annual fund-raising event that provides significant financial support for the Ozaukee County 4-H Foundation’s sponsorship of educational and leadership opportunities for adults and youth. The bowl-a-thon is held the third Sunday in January. Information and pledge forms are distributed to clubs in late fall; leaders encourage participation in this important fundraiser. Prizes are awarded to both individuals and groups in a number of different categories. There is also a traveling trophy awarded to the 4-H club raising the most pledges. PHOTOGRAPHY CONTEST – The photography contest provides 4-H photographers an opportunity to display their work, and learn about photography techniques by being involved in a photography competition judged by professional photographers. PINEWOOD DERBY – The 4-H Ambassadors sponsor a Pinewood Derby race to give 4-Hers an opportunity to craft and race a car in the competition. The Pinewood Derby encourages youth to apply science and engineering principles while creating an award winning car. 4-H DANCE – Each year the 4-H Leaders Association, along with the Older Youth Group, sponsors a 4-H dance as an evening of fun and fund raising. Proceeds from the refreshments sold at the dance are used to sponsor older youth attending 4-H opportunities such as Space Camp, Citizen Washington Focus, and American Spirit. Mr. and Miss Ozaukee 4-H and the 4-H Honor Court are a part of the evening festivities. A Dance-off is held for both the older and younger contestants and the moves are interesting. BUNNY BREAKFAST – Bunny Breakfast is a fun-filled Easter activity geared for children 10 and under and is open to the public. The event includes a pancake breakfast, games, craft activities, photos with the Easter Bunny, and is run by youth and adult volunteers. VOLLEYBALL TOURNAMENT – Each year 4-H clubs compete in a one-day countywide volleyball tournament. There is a senior and junior division. This is a 2 game double elimination format. The Older Youth raise money by selling food throughout the tournament. VARIETY SHOW – The annual 4-H Variety Show is held in Spring. It is open to all 4-H families and club members to share their creative talents. Entry areas include drama, novelty acts, vocal, instrumental, or dance performances. The show is planned and conducted by a countywide committee, which also holds auditions to select Variety Show participants. As part of the annual event, the 4-H International Committee conducts a raffle as its major fundraiser to sponsor participants in international travel programs. CLOTHING REVUE – Members enrolled in clothing and clothes horse projects participate in modeling garments they have constructed. Garments are evaluated on suitability of garment to individual, general appearance, construction in relation to general appearance, and wear ability. Two youth are chosen to represent Ozaukee County at the Wisconsin State Fair Clothing Revue. All youth that participate model their garment at style shows held during the Ozaukee County Fair. NEW FAMILY FAIR PREVIEW DAY – Get help with record books, participate in practice jusdging sessions, learn about online entry process, and hands-on fun. All new 4-H families should plan to attend. 4-H CAMP – The annual 4-H summer camp held at Camp Lakotah is a four-day adventure! 4-H camp challenges members to try new activities, create craft items, and explore nature and have fun at campfires, swimming and theme programs. Members 3rd through 6th grade and under stay at Base Camp; the 4-H Outpost Adventure is an opportunity for 7th and 8th graders to meet new challenges and develop outdoor skills. Campers ride a bus to camp, which is located in Wautoma. Youth 15 and older can apply to be camp resource staff and cabin counselors. See the 4-H Summer Camp page for more information. KICKBALL TOURNAMENT – A kickball game is enjoyed by club teams participating in this countywide activity. A trophy and ribbons are awarded to the winning team. COUNTY FAIR – The Ozaukee County Fair is a great opportunity for 4-H members to display or exhibit the results of their year’s project work. The fair is a community activity, where people can see what 4-H members learn and make during the year. Exhibits are judged by the “face to face,” conference or Danish system, with ribbons awarded and premiums paid. Special “outstanding” ribbons are given to a select number of exhibits; some are chosen for State Fair exhibition in the year following the County. 4-H members also participate in a variety of activities, demonstrations, sales/auctions, activity stations, and much more! The 4-H Food Stand is run by 4-H families during the fair; this is a county-wide 4-H fundraiser to support the program throughout the year. ANYTHING GOES – This popular activity includes fun filled games and contests between 4-H club “teams” and is conducted on consecutive days at the County Fair. Participants enjoy scoring points in a variety of ways, including such events as peanut races and water balloon tossing! Contests are planned and conducted by volunteer youth and adult leaders. MR.AND MISS OZAUKEE 4-H CONTEST – Each year an outstanding boy and girl can be nominated by their local 4-H club to participate in the Mr/Miss Ozaukee 4-H contest at the County Fair. Throughout the year, these representatives help with promotional activities, act as emcees at the Variety Show, help present awards at the 4-H Leaders Recognition Banquet, and assist with various activities at County Fair and Open House.